Gary Ryan Blair once said, “Advancement only comes with habitually doing more than you are asked.” If those words are true, then the Ultra Fast-Dry and Extreme Ultralight Backpacking towels from Discovery Trekking Outfitters just might be the true embodiment of advancement. Most of us have spent a lifetime wrapped in the traditional terry-cloth feel of the standard towel. Whether it’s for the beach, pool or shower, the feel of a terry cloth towel against our skin has become almost second nature to all of us. 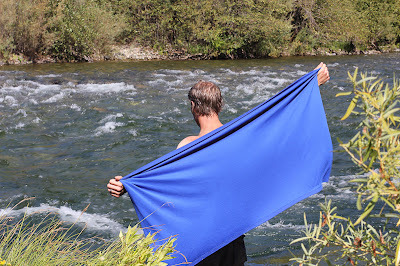 Yet not all towels are created equal, and the Ultra Fast-Dry and Extreme Ultralight Backpacking towels from Discovery Trekking Outfitters shatter expectations of what a towel should look and feel like. Thinner than cotton towels, these wicking towels are silky, highly absorbent, antimicrobial, quick drying and ultralight. 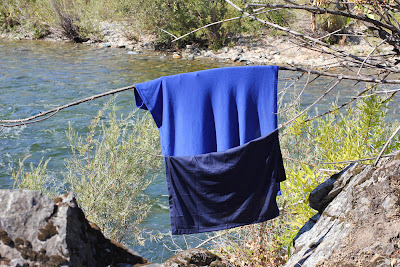 Whether you're in and out of the pool on race day, or hurling yourself into mountain fresh swimming holes, these wicking towels dry you off and then dry out just as quickly. Yet more than simply dry you off, the lightweight moisture-management fabric actually pulls the water from your skin. When the moisture reaches the outside of the fabric, it spreads out to many times its original surface area, enabling it to evaporate quickly. The durable fabric remains soft no matter how many times it dances through your washing machine. And with the largest size towel weighing in at less than 9 oz, the feather weight and compact size make it perfect when space is at a premium. That makes these the perfect towels for all of your outdoor exploits and adventures. Speaking of outdoor exploits, we've all had moments when our towel gets left in the swim bag or the back of the car. The unfortunate reward for our forgetfulness is that cantankerous mildew aroma. Yet the science behind these towels eliminate that issue. The fabric utilizes Polygiene odor resistant technology which takes advantage of pure silver. When applied to the fabric it helps control odors. The equivalent of 2 silver rings is used to treat over 5000 towels. Yet that's not the only reason this technology provides a more environmentally friendly option for the consumer. Polygienetreated materials can be utilized for longer periods of time before laundering is required resulting in the use of less energy, water and detergent. In other words, Mother Nature will appreciate these towels too. All of the wicking towels from Discovery Trekking Outfitters boast SPF sun protection blocking up to 93% of UV rays (the darker the color, the higher the SPF). That's great news for your mountain top excursions or for parents seeking another way to protect their little starfish from the harmful rays of the sun. Over the course of the review period, only one substantive critique was offered by our field team. The Gumption crew felt as though the addition of a quick-attach loop for greater drying ease would be a quality addition. A quick-attach loop would afford swimmers the option of securing their light weight towel to fences for fast drying sessions between races and allow backpackers the option of attaching the Extreme Ultralite to their pack for quick and easy access. Our crew has put these towels to extensive use in every conceivable situation. From morning training swims to the beach, from backwoods adventures to Disneyland, the towels from Discovery Trekking have met and exceeded any expectations one could possibly have for a towel this sheer and this lightweight. As a lifelong competitive swimmer and former professional water polo player I have personally spent a lifetime on pool decks wrapped up in the traditional terry-cloth towel. Now, after having the opportunity to use these wicking towels, you can count me as one of the converts. The science and technology behind the entire line-up of Discovery Trekking Outfitters towels ensure that the days of packing a musty, perpetually damp towel are for a bygone era. Whether you’re an avid outdoors enthusiast a professional swimmer or somewhere in between these towels are an essential component to your gear bag. We spend our days and nights vetting the latest and greatest products so you know what gear to trust when you're letting your outdoor soul thrive! Gumption… it’s an odd word, but it is the cornerstone of our philosophy, and we believe at the very core of what it means to be an outdoor enthusiast. As athletes and adventurers, we believe in pushing ourselves and our gear to the limits. We created Gumption Gear to share our insight and knowledge about the latest products and gear because we know you don’t always have the opportunity to test them before making that final purchase. We've dedicated ourselves to spending our days and nights vetting the latest and greatest products so you know what to expect from the gear that we’ve put to the test. Welcome to the Adventure!